9th – Alan Barnes + John Hallam + Tom Kincaid Trio – you could describe this as one of our “hardy annual” presentations. It’s certainly one of the highlight sessions of the year. Two superb saxophonists join together with the magical piano and rhythm sounds of the Tom Kincaid Trio to recreate the “standards” in their own inimitable way. A melodic musical evening par excellence. 16th – Wabash Jazzmen – “…….refreshing, vibrant hot five jazz” is an excellent description for this group which is driven along by the superb banjo playing of leader, Mark Challenor. Then add the talents of Mike Hayler on reeds, the memorable old alliance of Bill Smith and Mike Pembroke on cornet and trombone plus Richard Vernon on bass. Looking forward to a rousing, full spirited session. 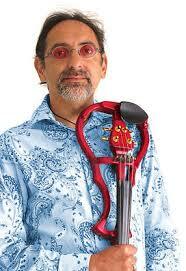 2nd – Ralph Allin Quartet – making a first appearance is this highly recommended violin virtuoso. Described by one critic as “Nigel Kennedy, Stephan Grappelli and Victor Borge rolled into one” as a result of his musical versatility and his witty presentations. By day, a leading light on the classical scene but, as the shadows lengthen, he spellbinds the world of jazz with his interpretations of the jazz standards. He has appeared at numerous festivals and with Van Morrison and Jools Holland. Sounds like a more than lively evening! 9th – Louis Louis Louis – and fast becoming a favourite of the Boston Spa audience is this energetic group of young musicians from Leeds whose repertoire – as the name suggests - reflects the hits of Armstrong, Jordan and Prima. Always a stirring performance and a joy for the R & B fans amongst you. 23rd Savannah Jazz Band – they just can’t stay away! Yorkshire’s Premier Jazz Band playing Yorkshire’s Premier Jazz Venue. Rollickin’ traditional jazz with a smattering of R & B and all tinged with a definite element of humour. We love them dearly. 30th – Manhattan Sound Big Band – and now to end the month on a high note, a welcome return by one of Yorkshire’s most respected Big Bands. As on previous occasions, there’s a wide ranging repertoire of classic big band tunes interspersed with some memorable vocal numbers. Nostalgia par excellence. Thanks for your support – it’s what keeps music live! Spread the word – JITS is live, fun and friendly – no better way to spend Saturday evening.